Almost three in four banks in Asia Pacific anticipate that fraud in their country will increase in 2019, according to a recent poll by FICO. Of specific concern are transactions completed when neither the card nor the cardholder is physically present (card-not-present or CNP fraud), as well as cards taken out by criminals under false identities (application fraud). These were identified as the two key concerns, as well as the biggest challenges to stopping fraud in 2019. “While protection against fraud is important, some banks are still struggling to balance prevention with customer convenience,” said McConaghy. “Smart communications is one tool lenders can use to deliver a frictionless customer experience. Engaging customers with an automated SMS or call to check if a transaction is genuine, while they are still at the register, engages them in the protection of their account and can have a positive influence on their impression of the bank”. Interestingly, banks in the region, are still measuring their fraud departments on key fraud metrics other than customer satisfaction. 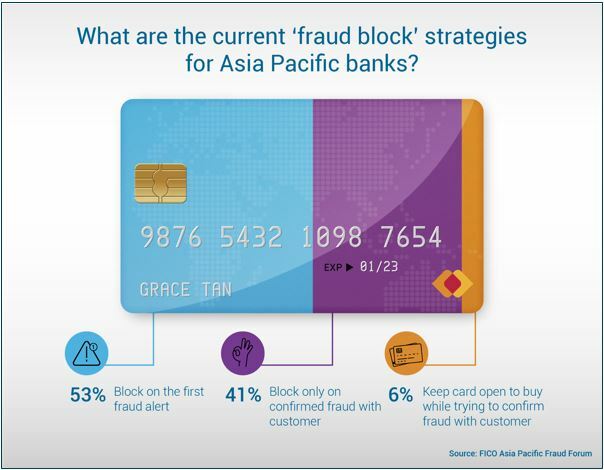 Overall fraud losses remain the leading indicator for 80 percent of APAC banks, followed by revenue at 10 percent. Only six percent of APAC banks ranked customer satisfaction as their number one metric and only four percent said customer attrition was their key measurement. Identity theft also remained a key priority for four-in-ten banks. Last year’s survey found that for one in five banks the number of fraudulent applications for credit cards sat between five to 10 percent.